Sorry I couldn’t send you a cake, but I have not done anything I haven’t had to do (except a thing or two). After I get thru taking my therapy I am so tired I usually sleep a while. I just went down once this week – didn’t do today but plan to go Monday. Dad fixed a swing for me in the furnace room and I pull my arm on it two of three times a day. Shirley & Mark & Becky are coming this evening for week-end. We received 5 shares of GM for our ten shares of DuPont. That is the way DuPont is disposing of their GM stock without upsetting the stock market. That suited us. We should have had more DuPont (we had 10). Int. Silver had climbed back up to 33. 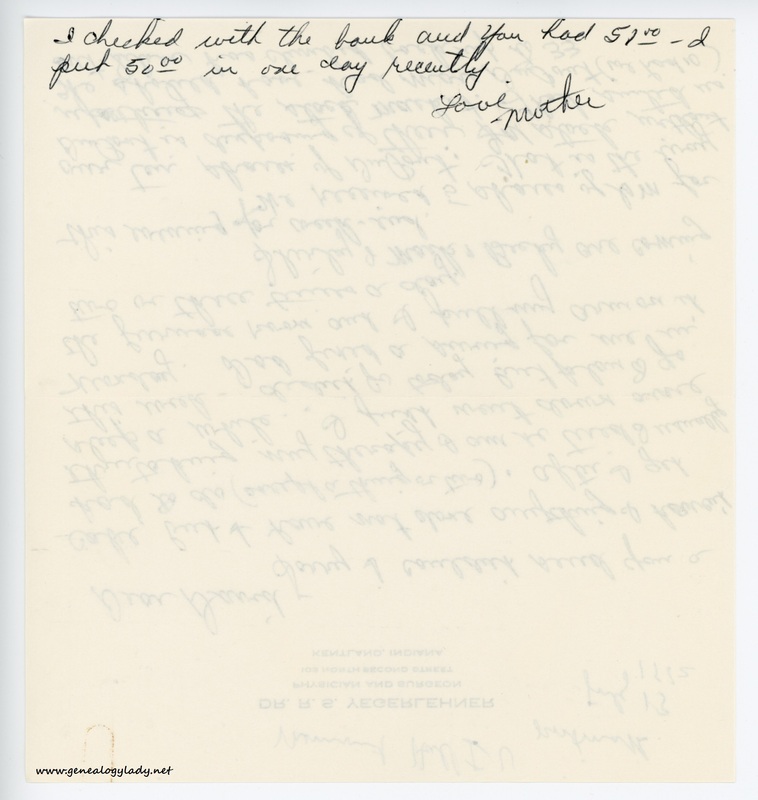 [page 2] I checked with the bank and you had $51.00 – I put $50.00 in one day recently. 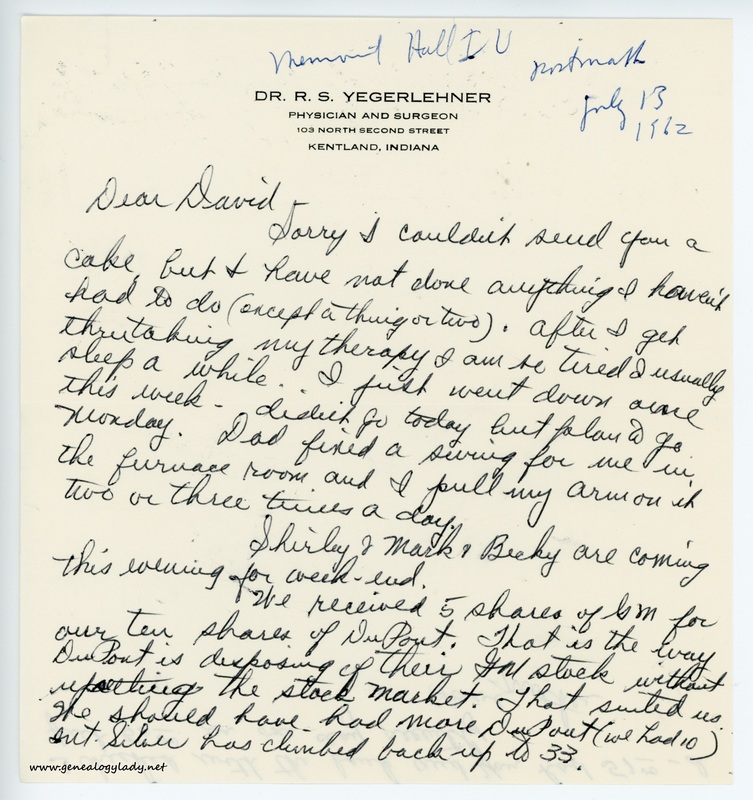 This entry was posted in Genealogy, Yegerlehner and tagged 1960s, David A. Yegerlehner, DuPont, genealogy, General Motors, Gladys R. (Foster) Yegerlehner, Indiana, Indiana University at Bloomington, Kentland, Mark A. Yegerlehner, Memorial Hall, Rebecca C. Yegerlehner, Roscoe S. Yegerlehner, Shirley (Ward) Yegerlehner on October 20, 2016 by Deborah Sweeney. “Sorry I couldn’t send you a cake” ??? Wasn’t my birthday. I really don’t recall paying all that much attention to the stock market, but they were really into it.